Annai Abirami Ashram is a worldwide spiritual Ashram in Sri Lanka based on the Vedic System of Aadhi Shankaracharya’s tradition. Our Ashram was founded on 1988 by Her Holiness “Aanmeega Guru” (spiritual guru) Arulmihu Aadhiparasakthi Amma fondly called as Amma. Amma is the founder, president and the Holy guru of our worldwide spiritual organization, under whose auspicious guidance we continue to serve Humanity, irrespective of religion, creed, caste or any kind of discrimination. At our Ashram, we help people find peace of mind and solace by enlightening them with spiritual knowledge. Thus uplifting Human values, so that everyone can live together in Harmony and peace. We share with everyone, the universal spiritual love with all who come seeking for it. Although we follow the Vedic system of Sanathana Dharma, our Ashram is a Place for multi faiths. We already are a whole community of devotees, spiritual seekers and volunteers of multi-faiths sharing spirituality. Her Holiness Arulmihu Aadhiparasakthi Amma our Holy Guru fondly called as Amma by our devotees was born on 1957 in a small village named Mudunakade, which is in Kandy district. Late Shri.Thangavelu the trustee of the Mudunakade Kathiresa Perumal temple and Late Shrimathi.Rathnaambal were her parents. She was born with three brothers and four sisters. During her childhood, she was very much inspired by the devotion of her father which later lead her to the path of spirituality. In her childhood, She studied at the Talatu oya Tamil Mahavidyalaya during when she was incurred with a lot of miracles. Later she became a primary school teacher. At age of 26, she got married to Shri.Karupiah Ramamoorthy and gave birth to 2 children who at present are sanyasis of Aadhishankaracharya tradition. It was just 6 months after when she gave birth to the second child she had a supernatural experience which turned her life completely into spirituality. From then on she slowly transformed as Her Holiness Aanmeega Guru Arulmihu Aadhiparasakthi amma. With the power of trance, she started serving humanity. She started healing incurable diseases. Provided solutions for all sort of problems by counselling. So on the service went on building a strong platform for spirituality. In order to provide proper and standard service to the public Soon with many more activities, she founded a spiritual organization named Annai Aadhiparasakthi Illam registered under the Religious Department. Many volunteers joined hands with her to conduct spiritual activity as well as social activities too. She understood that only a spiritually enlightened disciplined community is a healthy community. So she started to render spiritual discourses thus enlightening the masses. In order to take on the selfless spiritual service on to the future, she decided to prepare some of her young disciples to take the task into their hands. She carefully selected some disciples and gave them brahmacharya Deeksha and started giving them hard spiritual training. Some disciples could not cope up with training and fled the ashram, finally, only 3 out of 7 were able to complete the training and they were given the sanyasi Deeksha of the Aadhishankaracharya tradition. They have been taught on several aspects of spiritualism. Thus the organization was then transformed into an ashram and facilitating the devotees to gain the divine knowledge of Vedas. At present Our ashram, Annai Abirami ashram continues to serve the devotees with the guidance of our spiritual Guru Her Holiness Arulmihu Aadhiparaskthi amma. We at our Ashram have a small temple or madaalayam. Daily poojas and special poojas are conducted by the sannyasis of the ashram with the guidance of our Holy Guru Her Holiness. Arulmihu Aadhiparasakthi Amma. There are several Deities been installed(pradishta) at our temple. 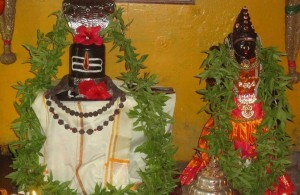 The Moolavar being Shiva linga named Amareeshwara Nathar with his consort Amareeshwari devi. Daily poojas are held two times a day in our Ashram’s temple. Besides daily poojas, Special poojas and Archana are also held on special occasions. However before starting to chant mantras the student or one who wants an initiation for mantra chant must get the mantra initiation from a proper Guru or a Vedic teacher who is well versed in mantra shastra, because chanting mantras in an improper way may bring in negative vibrations that may create a negative effect. Thus the mantras take a significant part in performing poojas and Homas or Yagnas or any rituals connected to humanity. Mantras chanted in a proper way brings peace of mind and prosperity. As per Bhagawan Sri Krishna’s divine words, in kali yuga chanting and singing of names of gods and goddess is the perfect way to attain self-realization which leads to Jeevan Mukthi. So according to Shri Krishna’s preaching Naama Sangeerthana also called Bajans are conducted to uplift the human minds to the state of bhakti thus relaxing the mind to attain peace and share love and devotion with each other. We help our devotees by helping them with their day to day activities by counselling and providing solutions for their problems. Many devotees come in search of their solutions to their problems daily, after a complete and careful analysis of their remedies or solutions or counselling is given to them in order solve their problems. Healing diseases with the divine power of Goddess Aadhiparasakthi. As our Guru is gifted with the power of trance she meditates upon Goddess Adhiparasakthi and prescribes medicines which mainly consists of herbs and viboothy or pasmam(holy ash). Devotees who receive the medicine must strictly abide by the rules and regulations to acquire 100% results. Thus a lot of devotees have followed our Guru’s medical advice and miraculously have got rid of their diseases. We have been rehabilitating mislead youth who had got into bad habits and got themselves into a confused mental state. Some who were trying to commit suicide, some trying to flee their homes for unusual reasons, some addicted to drugs and smoking. Homas and yajnas are one of the most powerful means of communion with the Deities. Conducting Homas and Yajnas fulfils the Devas so that in return they bless us with prosperity, peace of mind, good health, vigour and eternal knowledge. We at our Ashram perform Homas and Yagnas for both personal and public benefit. Sunday school or Araneri Paadasaalai is where we teach young children about the dharma and moral values of our life. At our ashram, Sunday School was inaugurated by our holy guru on 06.08.2000. At present, a lot of young children study at our Sunday school. We not only educate children with religious and cultural knowledge but also conduct practical spiritual workshops in order to guide them to the highest level of humanity, educating young children with moral values and Dharma. As always everyone knows proper education provides a stable and steady pathway to achieve success in life. Education provides discipline, good communication skills, good conduct and much more. The importance of education is essential in this fast-moving technological world. According to the guidance of our Holy Guru, we have organized a committee which would work under direct supervision of our Guru to help the poor students in their educational activities. Many good students are unable to continue their studies to attain a good educational qualification due to poverty and also other family circumstances. In order to help them our youth wing of ashram has come forward to help these students. Spoken English, spoken Sinhala, and Spoken Tamil. We have been providing educational tools to students. We also provide educational counselling and all for free. During this process, we came to know that a lot of Eligible students in schools after their completion of the high school are not following on to their higher studies due to financial problems. So we are trying to help these students to study further. Some generous people are supporting us. In future, we have planned to extend our educational services so that we can build a well-educated community. Jothisham or Astrology is a Shastra (a branch of Veda) which is depicted as the eye of the Veda Purusha. Meaning, if Veda is considered as a man then jothisham is his eyes.This divine knowledge is said to be passed on to the Vedic rishis by the Aadhi guru God Dakshinamaoorthi himself. Then the knowledge was passed on to deserving disciples and so on till now. Astrology reveals a person’s past, present and future thus facilitating one to make correct decisions in important moments of his life. We, in our ashram with the guidance of our Holy Guru, help our devotees by providing astrological predictions and solutions. Daily poojas are held two times a day in our Ashram’s temple. Besides daily poojas, Special poojas, and Archana is also held on special occasions. Thiruvilaku pooja or Oil lamp pooja is very important pooja which is held at our ashram every Friday mornings and Pournami days. The significance of the Oil lamp is very much highlighted in Vedic scriptures and Agamas. It is clearly understood that never a pooja or any religious or cultural ceremony is started without lighting an oil lamp. A lamp is compared to a human body and when the lamp is lit with devotion by a person it can show whatever the problems the person is conferring and the Guru identifies it and provides the remedies. A pooja can be performed just with an oil lamp even without a sculpture or any other yantras. But no pooja is done without lighting an Oil Lamp. Arul Vaaku or oracles are given to devotees who come to our Ashram in search of a solution to their problems. Arul Vaaku is given by our beloved Guru Her Holiness. Arulmihu Aadhiparasakthi Amma – Universal Mother Goddess Aadhiparasakthi. During Arul Vaaku, kind and gracious Goddess Aaadhiparasakthi enters into our Holy Guru’s body and after when she starts to speak with her children(devotees). A person who wants to hear Arul vaaku must come with a clean body and mind and with devotion. She starts saying the Arul Vaaku even before any question is asked by the devotee. She, by the power of her Arul vaaku foresees the future and helps the devotees in finding a solution for their problems in an amazing way regardless of the depth of the problem. Her blessings bestow with bliss and peace of mind. She teaches and guides us to attain a higher stage of realization thus building a healthy and peaceful community. The Dharma includes duties, rights, laws, conduct, virtues and ‘‘right way of living. Each and everyone in this world has a Dharma to follow in his life. For example, a teacher’s dharma is to teach and provide knowledge to his/her students. One who follows his dharma properly is blessed and virtuous. Even Nature, the animals, birds and all living beings has their own dharma and they follow it properly. For instance, all the fruit-bearing trees bear fruits in the correct season they are meant to, but only humans alone terminate their dharma and cause an imbalance in nature which leads to destruction. One of the greatest teachings of dharma, the Bhagavad Gita was given to us by Bagwan Sri Krishna just before the start of Kali Yuga in order to enlight the entire humanity. Thus it is very essential for every Human being to understand and follow their Dharma so that everyone would live with love and peace. Here at our Ashram, we help our devotees to identify their duties and rehabilitate the mislead with dharmic teachings and counselling.